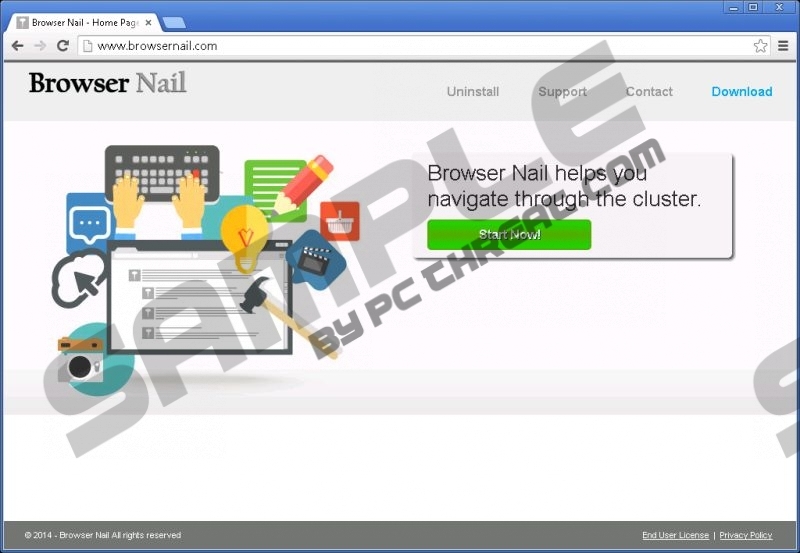 Browser Nail is an adware application that users install on their own computers. Chances are they do not even realize that Browser Nail enters their systems together with freeware. You will definitely notice that something is not right when you get spammed with pop-up ads. In order to get rid of annoying commercial advertisements, you need to remove Browser Nail from your computer. You can do it manually, but it is strongly recommended that you run a full system scan with a licensed antispyware tool, because there are more unwanted applications on board. We know exactly what to expect of Browser Nail because we have seen similar applications before. This program belongs to the SuperWeb family of adware applications. If you take a closer look at browsernail.com, you will see that this website is practically identical to other adware web pages. Almost all adware applications from the SuperWeb family use the same template for their websites. As such, Browser Nail is identical to Spark Cast, SnipSmart, Deal Keeper, and many other applications. The program may seem like a useful browser extension, but in reality it does not do anything beneficial. Rather than providing you with reliable information, Browser Nail slows down your browser and redirects you to suspicious websites. Browser Nail is compatible with the Mozilla Firefox and Internet Explorer web browsers. The official website claims that Browser Nail works on Google Chrome as well, but our research shows that the newest Google Chrome versions block this extension, which is one of the best proofs that Browser Nail is not a reliable application. It has been created to generate financial profit for its developers. Each time you click an ad provided by Browser Nail, you get redirected to an adware-related website, and the people behind Browser Nail make money via a pay-per-click system. Avoid this by removing Browser Nail from your system at once. Since this program clearly comes with other unwanted applications, you need to terminate all the potential threats at the same time. If you are not sure which programs must be removed from your PC, make use of the SpyHunter free scanner. The scanner will generate for you a list of potentially unwanted programs, and you will be able to erase them in no time. Select Uninstall a program and remove Browser Nail. Open Uninstall a program and remove Browser Nail. Select Add or remove programs and uninstall Browser Nail. Quick & tested solution for Browser Nail removal.